The Muskego Storm Organization will hold tryouts for the 2018/2019 season mid summer. Please be sure to check back for dates and times. First and Second graders who will be age 8 prior to September 1, 2019 are recommended to tryout for U8. Players trying out for U9 thru U12 cannot be older than their respective age bracket prior to May 1, 2019. U13 and U14 teams are grade based. Our organization will not mandate that you play age based but will give your family the option if your son has a birthday which is affected. 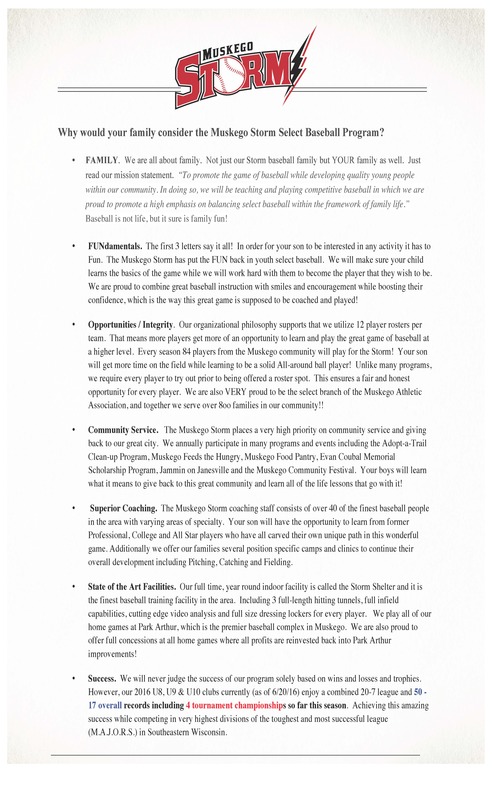 For further questions please email us at muskegostormbaseball@gmail.com. For your convenience please find our online registration below which must be completed before tryouts. 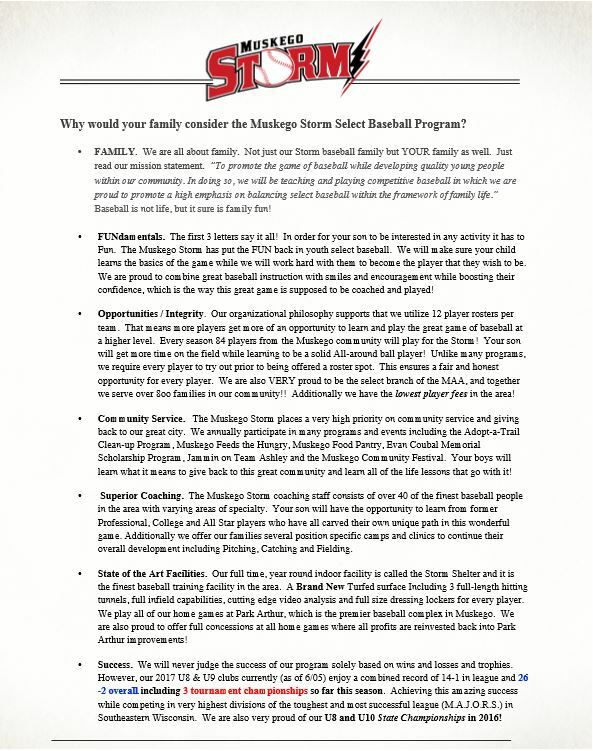 *If you have any questions please don’t hesitate to contact us by email at muskegostormbaseball@gmail.com. HAVE FUN! Bring along something to drink as you will be running and working hard during your tryout. Don’t be LATE! We would like players to arrive at least 15 mins early to allow for registration and warm ups. Bring your glove and bat, the organization will have plenty of baseballs on hand. Be attentive and listen to the coaches and evaluators. If there is a question please don’t be afraid to ask. RESPECT those trying out as well as the evaluators/coaches. HUSTLE! Run to and from your position and from station to station. Stay positive, don’t let one mistake turn into two.